The current climatic changes have resulted in the increase of temperatures all over the world. Although, people are highly concerned about the snow melting in Antarctic, they also care about keeping the right temperatures within their homes and businesses. After all, most houses are equipped with HVAC systems that can regulate the warm summers in California because not all people can stand high temperatures. Newborn children, elderly or sick people must be kept in steady temperatures and healthy environments. Schools, nurseries and hospitals cannot afford bad quality atmosphere indoors and no business, private establishment or residence can take any more expenses on huge consumption of energy. 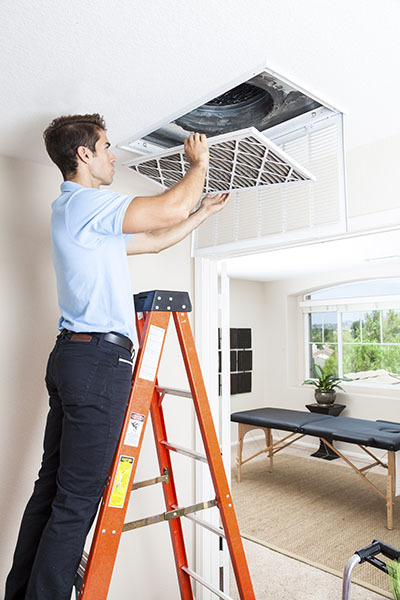 The air ducts behind each HVAC system, stove, dryer or any other appliance are to be blamed for the most unpleasant cases and Air Duct Repair Concord has established the right foundations to take care of these problems once and for all. Ducts can create problems either because they are very dirty or damaged. Of course, they can be both as well because our technicians, who specialize on air duct repair, will have to clean the excessive dirt in order to detect the problematic points and let the ducts breathe. Don’t forget that a great percentage of the houses in Concord are really old. Some of them date back prior to the second great war and signify the importance of a good and thorough air duct repair service. At that time, people were ignorant about quality materials and the benefits of good insulation. Therefore, most ducts are completely naked and, thus, unprotected by the weather fluctuations. For this reason, our technicians are always prepared for air duct coating repair with modern substances and materials, which can ensure excellent insulation and, thus, better temperatures indoors. The basic goal of our air duct repair company is to restore the damage. For this reason, it is important for our technicians to detect the exact spots, where the ducts are disconnected and, thus, small gaps have been created and allow air to escape. Our professionals have come across some ducts in terrible condition with parts connected with a simple scotch tape and complete absence of sealing. Their main target now is to seal these gaps and install small metallic panels on the connections to keep the air in the right tracks. Of course, they are perfectly equipped and have access to the best materials and follow the best methodologies for effective and long lasting air duct seal repair. When every hole and damage is properly fixed and the filthiness has been thoroughly cleaned from the inner parts of the ducts, you will be breathing better for two reasons. First, you will be enjoying a clean and healthy environment free from any harmful microorganism. Second, you won’t be afraid to open the mail and face the next electricity bill because the amount will be much lower than today. Air leaks due to the damaged ducts and results to excessive waste of energy. When it escapes though holes and never reaches your room, the HVAC unit will work more hours trying to substitute the lost amounts. Thus, the contribution of Air Duct Repair Concord will be triple. We will help you consume less energy and, thus, you will spend less and contribute more to the protection of the environment and we will provide the healthiest indoor environment.